If black 'mirrors' whites 4. d4 in the Scotch 4 Knights and white wants to play sharp, aggressive moves. what would be the best move? I know that chess engines like stockfish, GNU Chess etc. would calculate the next move for white as Bb5, but I want to exchange pieces. So what would the strongest capture be here? 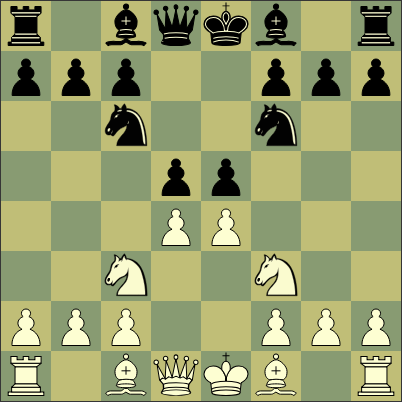 According to https://www.365chess.com/opening.php?m=9&n=17985&ms=e4.e5.Nf3.Nc6.Nc3.Nf6.d4.d5, exd5 is the strongest capture for white, with a 83,3% win rate. I hope that it helps you! Note: Bear in mind that by intentionally opting for lines such as above where you favour trades and direct aggression, you'd be naturally walking into highly tactical positions, so be prepared to calculate many many relevant lines at each point (specially in the given examples above). Not the answer you're looking for? Browse other questions tagged opening four-knights or ask your own question. In this QGD Exchange variation, how should white deal with 6 …Bg4?